What is Actinic Cheilitis (AC)? 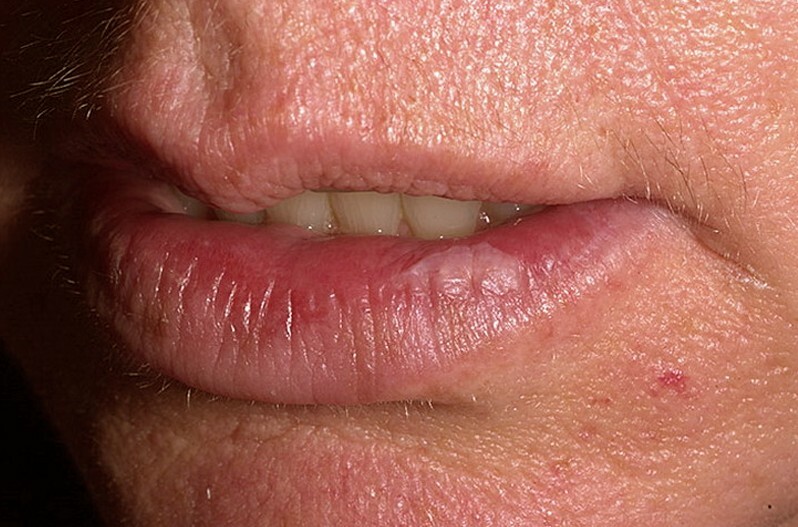 Actinic cheilitis manifests a diffuse or patchy dryness and variable thickening of the vermillion of the lower lip. The prevalent form of actinic cheilitis is due to chronic sun exposure. 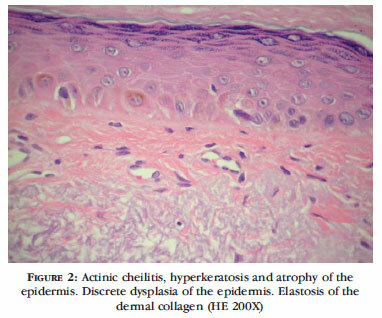 It is also called actinic cheilosis, solar cheilitis and sometimes, actinic cheilitis with histological atypia. AC almost always affects the lower lips and only rarely the upper lip, probably because of the lower lip more exposed to the sun. In the unusual cases reported where it affects the upper lip, this may be due to upper lip prominent commissures (corners of the mouth are not usually involved. Affected individuals may experience symptoms such as dry sensation and cracking of the lips. It is usually painless and persistent. The appearance is variable. White lesion indicates hyperkeratosis Red, erosive or ulcerative lesions indicate loss of epithelium and inflammation. Early, the acute lesion may be erythematous (red) and edematous (swollen) months and years of sun exposure, the lesson becomes chronic and may be gray-white and appear dry, scaly and wrinkled. Why Do I Have Dry and Chapped Lips? There is thinking whitish discoloration of the lip at the border of the lip and skin. There is thickening whitish blotch of the lip at the rim of the mouth and skin. There is also a decline of the usually sharp border between the red of the lip and him normal skin, known as the vermillion border. This may become flaky and hardened as AC continues. When rubbing your hand against the lip, you may notice the lip have a texture similar to rubbing the gloved finger along sandpaper. AC may occur with skin lesions of actinic keratosis or skin cancer else particularly on the head he neck since these are the most sun-exposed areas. Rarely it may represent a genetic susceptibility to light damage (e.g., xeroderma pigmentosum or actinic prurigo). Light skin complexion: the condition typically affects people with lighter skin tones. Partially Caucasian living in tropical regions. IN one report, 96% or person with AC had phenotype 11 according to the Fitzpatrick scale. Age: AC commonly affects older individuals, and rarely those under 45 years old. Actinic cheilitis also describes lip improvement in actinic prurigo, a rare form of photosensitivity. Actinic cheilitis largely influences adults with fair skin who live in tropical or subtropical areas, especially outdoors workes. They frequently recall having sunburned lips in earlier years. They may also have actinic keratoses on other sun-exposed sites of the scalp, ears, face, and hands. 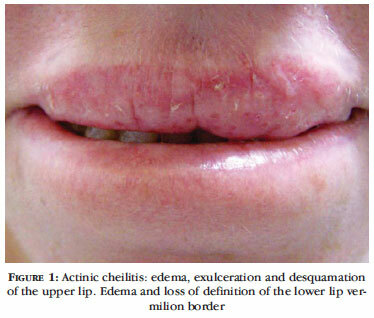 Actinic cheilitis is three times more in males than in females. Actinic cheilitis results from chronic exposure of the lower lip to solar ultraviolet radiation It is more vulnerable than encompassing skin because mucosal epithelium is thinner and less pigmented than the epidermis. What are the clinical symptoms of actinic cheilitis? Prominent folds and lip lines. What is the complication of actinic cheilitis? Intraepidermal carinoma (Bowen disease or squamoous cell carinoma in situ) . Cancer of the lip is more in smokers than in non-smokers. Other factors involve oncogenic human papillomavirus (wart virus), immunosuppression and alcohol abuse. Invasive squamo us cell carcinoma should be suspected if the lip is focally tender, or a persistent ulcer or enlarging nodule develops. How is actinic cheilitis diagnosed? Actinic cheilitis is generally diagnosed clinically; a skin biopsy may require fluorouracil if skin cancer or an inflammatory cause of cheilitis is presumed. The pathological characteristics of actinic cheilitis are mutable thickening or atrophy of the lip, partial thickness epidermal dysplasia, solar elastosis and inflammation in the dermis of the skin. What is the therapy and treatment options for actinic cheilitis? Smoking for an extended period, and lifelong, year-round, daily sun protection are essential. Men can consider growing a mustache. Photodynamic therapy -Photodynamic therapy (PDT) is a treatment that uses a drug, referred to a photosensitizer or photosensitizing agent, and a distinct type of light. When photosensitizers are revealed to a specific wavelength of light, they produce a form of oxygen that kills nearby cells. Each photosensitizer is activated by light of a specific wavelength. This wavelength defines how far the light can travel into the body. Thus, physicians use specific photosensitizers and wavelengths of light to treat different areas of the body with PDT. Imiquimod cream (Aldara) is an immune response modifier that has been analyzed for the treatment of actinic cheilitis. It develops an immune response in the skin leading to apoptosis (death) or the tumor cells. It produces the epidermis to be invaded by macrophages, which leads to epidermal erosion. T-cells are also stimulated as a consequence of imiquimod treatment. Imiquimod seems to promote an “immune memory” that decreases the recurrence of lesions; There is minimal scarring. Complete clearance has been shown in up to 45% of patients with actinic keratoses. However, the dose and duration of therapy as well as the long-term efficacy, still need to be established for the treatment of actinic cheilitis. 5-fluorouracil cream – Topical 5-fluorotic (5-FU, Efudex, Carac) has been shown to be an efficient therapy for diffuse, but minor actinic cheilitis, 5-fluorouracil works by blocking DNA synthesis. Cells that are quickly growing require additional DNA, so they accumulate more 5-fluorouracil, ending in their death. Healthy skin is much less affected. The treatment normally takes 2-4 weeks based on the response. The expected response includes a swelling phase, followed by redness, oozing, burning, and finally erosion. Treatment is discontinued when ulceration and crusting develop. There is minimum scarring Complete clearance has been reported in about 50% of patients. How can actinic cheilitis be prevented? Actinic cheilitis can be avoided by protecting the lips from sun exposure. IN smokers, the risk of cancer can be reduced by smoking cessation.